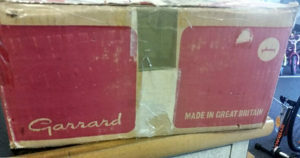 A very rare chance to purchase one of Garrards iconic Rim Drive Turntables .Brand New in original carton . Among the conventional (i.e., non-zero-tracking error) changer models in the Garrard line, the model 82 is the finest. Its quality will be apparent from the fact that it’s virtually identical to the Z92 except for the tonearm. Even in this medium-price range, Garrard builds its turntables with the same attention to features and the same precision as its top-of-the-line, state-of-the-art models. The motor is still the famous Synchro Lab design, combining the powerful torque of a 4-pole induction motor with the constant-speed accuracy of a synchronous motor. It’s magnetically screened and shock-mounted. 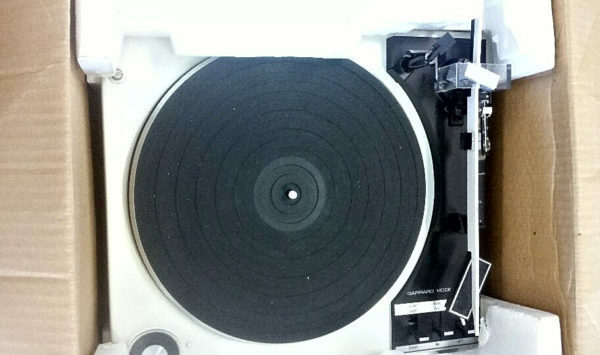 The tonearm, even though it has the conventional fixed offset, is otherwise built like the arm of the Z92. The stylus-force adjustment is of the highly accurate sliding-weight type, without springs. device is calibrated for both spherical and elliptical styli. Garrard’s two-position cartridge-tilting lever for maintaining the 15′ vertical tracking angle is also included. Another important feature is two-point support for the record stack, to prevent enlarged center holes. Considering its extremely seasonable price, the Garrard 82 may well be today’s top value in a changer for those who don’t absolutely insist on zero tracking error.